Great for anyone that needs an overdrive / clean boost in one. Tons of tonal flexibility, great build, low noise operation. Best warranty and support in the business! 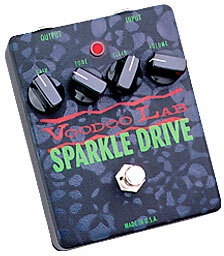 The Voodoo Lab Sparkle Drive is an overdrive pedal for those players that need an organic sounding overdrive to either achieve a little bit of blues "breakup" or to push a tube amp harder into high gain territory. The Sparkle Drive comes in a sturdy metal enclosure and has 4 controls: Gain, Tone, Clean and Volume. It has Input and Output connectors on the top of the unit, unlike standard pedal designs that are usually on the left and right side so that might fit a little awkward in some pedalboards that rely on the more usual left and right side input/outputs. The unit can be powered via 9v power supply adaptor (not included) or by a 9v battery which in order to install one has to remove 4 screws at the back of the unit. That is a bit of a hassle, especially when you're in the middle of a gig but as most of my pedals end on a pedalboard it really wasn't a huge concern for me. Voodoo Lab weren't sure on approximate battery life but they assured me that the Sparkle Drive is not a battery vampire and according to my tests so far it has performed favorably compared to the competition, probably one of the most energy efficient designs out there as well. The "Gain" control is self explanatory - turning it to the left to right increases the amount of gain. On a clean amp you don't really notice that as much as the gain all the way to the right offers maybe something I'd describe as mild blues breakup, something akin to a B. B. King lead sound. The "Tone" control offers tone brightness from left to right, so the more you go to the right, the more cutting the tone gets. The "Clean" control offers amount of clean boost to be dialed in and the "Volume" control controls the overall volume output of the unit. What is unique about this pedal is the fact that it also comes with a clean boost which can be dialed in at the player's discretion. This pedal can also serve just as a clean boost for solos when the "Gain" knob is turned almost all the way down. I personally have used this amp quite successfully to get something like a Metallica "Kill 'Em All" or Megadeth "Peace Sells..." sound from a Marshall JCM900 tube amp that was in crunch mode and needed a bit more help to break up. With a little bit of drive at about 3 and boost at about 5, I was able to get the amp screaming into thrash metal territory and still maintained the overall authenticity and percusiveness of the amp's sound. On an Ashdown Fallen Angel tube head with darker gain channel character it managed to dial in some great early Black Sabbath tones that were pure heaviness. On some of the cleaner blues amps, like Fender Princeton it managed to deliver a slightly overdriven blues sound and some clean chicken pickin' sounds that were totally organic and transparent. In other words - this box does wonders through pretty much every amp we've put it through! Opposed to some other pricier stalwarts on the overdrive scene I'd have to say that the Sparkle Drive performed quieter and delivered more tonal nuance. There are all kinds of tones on tap here but like any other overdrive unit - this one needs a tube amp at a crunch level in order to goose it up to metal territory so results may differ due to the difference of amps used. It is definitely not the gainiest overdrive of the bunch but it definitely offers pristine sound quality and an extra boost option which can goose an amp's channel further than some of the higher gain options, or in some cases it turns out you just needed a higher guitar output to get there so the clean boost does the job by itself without the extra drive. This is probably the most versatile overdrive pedal I've ever used. Having the clean boost though begs asking the question why Voodoo Lab didn't add an extra switch to turn on/off that as well? Now this would've been pure heaven as the boost function can work as a solo boost on top of an already overdriven sound but at this price point this is hardly a huge issue and the design would've most likely become more expensive. Earlier reviews of this unit offer the opinion that this pedal is not for the metal players but I beg to differ. I have suggested this as an Ibanez 808 Tubescreamer replacement and it has so far always been a winner. Compared to that "classic" pedal the Voodolab sounds more organic, doesn't suffer the low frequency tone loss, performs quieter and on top of that can drive the amps harder due to the added clean boost. At this price point, made in U.S.A., full bypass, top grade electronics components, built like a tank, 5 year warranty, and backed by the wonderful personal care customer support of the Voodoo Lab staff (you need to experience it to believe it!!!! ), this pedal is a total no brainer. Get not one but TWO TODAY!